After you and your vehicle hit the road, be sure to come back to our award-winning service department for routine maintenance and other repairs. Our qualified service technicians are here to help with anything from simple repairs to major issues. And if you need parts, be sure to contact our parts department about genuine OEM parts. Are you ready to work with a dealership that will provide exceptional customer service and incredible prices? 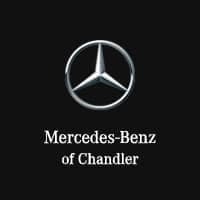 Come to Mercedes-Benz of Chandler today, conveniently located at 1-10 and Ray Road. Feel free to contact us with any of your questions, anytime!